Ebbsfleet will be the latest team to try and breach the National League’s meanest home defence when they travel to The Shay on Tuesday (7.45pm). Halifax have only conceded nine goals in their 19 home league games this season, and have not conceded a home goal in eight hours. Town have kept six clean sheets in their last seven home matches, and last conceded a home league goal on New Year’s Day. Town go into the game with a symmetrical record, having won 11, drawn 17 and lost 11, and having scored and conceded 35 goals. They secured an impressive 2-0 win against title-chasing Solihull Moors on Saturday, although Ebbsfleet also go into the match on the back of a 2-0 win, having beaten Maidstone at the weekend. That was their third win on the bounce, while they have kept four clean sheets in their last six outings. Only Leyton Orient and Fylde have lost fewer away league games and conceded fewer away league goals than Ebbsfleet in the division. Halifax could move up to 12th in the table if they win, while Ebbsfleet can move into the play-off places with a victory. 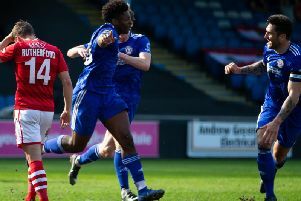 Defender Ryan Sellers is not expected to be available due to a knee injury, while the game will be the last in loan duo Devante Rodney (pictured) and Manny Duku’s month-long stay with Town, unless their deals can be extended. Both go into the match in good form, with Rodney scoring three in his last four appearances, and Duku netting two in four.